Converts M.2 SSD into exact 2.5" or U.2 SSD in dimension and screw holes. Compatible with any systems with 2.5" or U.2 drive bay. Ideal for laptop and desktop system upgrade. 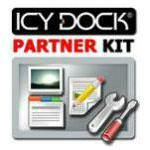 Copyright © 2018 ICY DOCK.tw All rights reserved.